The research report titled “Digital PCR Market: Global Industry Analysis (2012-2016) and Forecast (2017-2026)” by Persistence Market Research has presented valuable insights associated with adoption of digital PCR market across various end users and across key regions focusing on various applications and product types of digital PCRs in a systematic format explaining the influence of various aspects on the growth of the individual market segments. The report also focuses on trends, developments, opportunities, drivers and restraints impacting the growth of the global market. The cohesive report structure presents the market statistics in a logical format enabling the reader to garner relevant market acumen in a convenient manner. The research study delivers a holistic view of the global digital PCR market with the help of detailed market segmentation. The research report starts with an executive summary followed by market overview and global market analysis and segmental forecasts and statistics across important regions in the globe. The market overview section covers market segmentation, definition Y-o-Y growth analysis, supply chain analysis, cost structure, overview of market dynamics, pricing analysis, raw material sourcing strategy and analysis, service provider list and outline of key participants in the global digital PCR market. The research report delivers value to the reader by portraying the future market projections based on various trends as well as historic statistical data and current market scenario. Moreover, the research report also provides intelligence on key companies in a dedicated section called competitive analysis. This section covers various facets about the competitors that can be used to gain competitive advantage going forth and establish hold in the digital PCR market. Persistence Market Research follows a systematic and an exquisite research methodology to track and gain intelligence on numerous market parameters. Extensive secondary research is carried out to scale overall market size, identify key industry players, industry associations, top products, etc. Data gathered from secondary research is collated and verified through primary research. Several primary interviews are conducted with which each data point is evaluated multiple times by interviewing key personnel such as market observers and subject matter experts. Primary research is carried out across various regions to get a realistic picture of a particular segment and the global market. The data is triangulated and reflects high accuracy percentage and can be directly used by the reader to make informed decisions and plan tactics or future moves. The global digital PCR market is segmented on the basis of product type, end user, application and by region. This detailed market taxonomy enables to gain a thorough understanding of the global market. The report covers a holistic view of the digital PCR market with an unbiased approach giving real time market insights based on weighted market analysis on statistics and numbers. Data crunching done in the research report undergoes multiple funnels of cross validation that takes the market numbers to a near 100% accuracy. Each segment analyzed across various regions and sub regions gives a direction to the reader to plan expansion moves and tap new regional markets. Historical, current and future market projections have been included in this research report along with actionable insights that can be used by the reader to gain competitive advantage. Moreover, the report structure is systematic and convenient for the reader to read. A 24x7 analyst support is also provided as and additional service to clients to add necessary value addition and also cater to client queries. Digital PCR (Polymerase Chain Reaction), also referred to as dPCR, is a biotechnological advancement of the conventional PCR (polymerase chain reaction) procedure which is typically used to clonally amplify as well as quantify strands of nucleic acids that include RNA, cDNA or DNA. As against traditional PCR method, digital polymerase chain reaction is a highly precise procedure while measuring amounts of nucleic acid. However, if handled by inexperienced users, the digital PCR method is likely to reflect errors. This quantitative method is simple as well as reproducible and does not depend any calibration curve while carrying out quantification of the sample target. Several benefits of digital PCR include accurate quantification, improved CNV detection and rare allele, enhanced sensitivity for target detection and heightened capability of multiplexing. The global market for digital polymerase chain reaction witnessed a steady growth since past years. Since the introduction of the digital PCR process, it has been widely used in learning variations with respect to gene sequencing. A positive climb is expected to be witnessed in the coming years and Persistence Market Research has analysed various factors that are expected to contribute to this upward growth of the digital PCR market. The growth fuelling aspects include various trends and drivers that have a direct influence on the market. The research report also discusses restraints and challenges hindering the growth of the global digital PCR market. The report also contains opportunity assessment, along with value chain analysis and competitive scenario that portrays a holistic outlook of the global market for polymerase chain reaction. As per Persistence Market Research, the global digital PCR market is expected to grow at a stellar CAGR throughout the period of assessment, 2017-2026. In 2017, the global digital PCR market reflected an estimate of about US$ 103 Mn and is estimate to touch a valuation more than US$ 215 Mn by 2026 end. North America region is poised to reflect higher market attractiveness index for digital PCRs. The region is marked with technological advancements, higher expenditure on research and development and enhanced healthcare infrastructure. The digital PCR market in North America is expected to grow at a robust CAGR and is anticipated to reach a comparatively high market valuation of around US$ 75 Mn by 2026 end. On the contrary, emerging economies in Asia Pacific excluding Japan region have contributed towards increased adoption of digital PCR method for quantifying nucleic acid amounts. This region reflects high growth potential for digital PCR market and various players involved in digital PCRs are setting up plants in various region in APEJ. 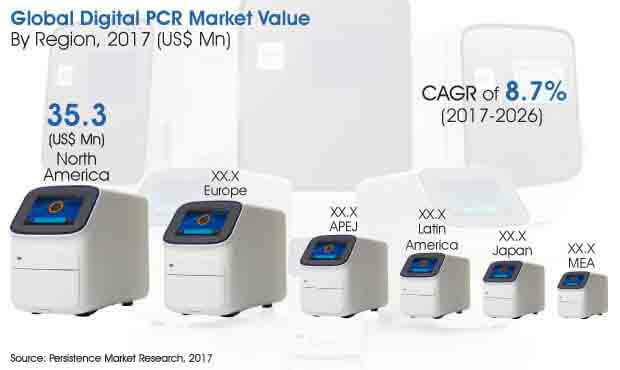 The digital PCR market in Asia Pacific excluding Japan (APEJ) is projected to grow at the fastest rate to register the highest CAGR of 10.8% throughout the period of assessment. The analytical research report on global digital PCR market covers competitive analysis. This section includes intelligence on various market players, such as SWOT analysis, company overview, key personnel, strategies and key financials. Information on major companies, namely, Thermo Fisher Scientific Inc., Bio-rad Laboratories Inc., Fluidigm Corporation, STILLA Technologies, RainDance Technologies, JN Medsys and Formulatrix has been included in this chapter.